Vicki Eger; my friend - Last Shot Fired - Brian Enos's Forums... Maku mozo! Vicki Eger, My friend of over 20 years and an avid shooter, passed away this afternoon from widespread cancer. She was diagnosed only 5 weeks ago. When I get more info, I will post it. I know the family would appreciate your thoughts and prayers. She was a great woman and a good friend. She will be missed. Don't F&@% with my monkey! Prayer sent for the family. I'm sorry for the loss of your friend. Richard said that this was a super aggressive cancer and had spread to the liver, kidneys, and probably brain. I didn't know your friend but I am so sorry for the loss you & her family are feeling right now. I pray God will send comfort to you all & healing in time. Vicki was a very sweet lady we will miss her. Prayers for her and family. Not the clearest picture, but it's nice to put a face with the name. Vicki was always smiling or laughing, so this is fitting. 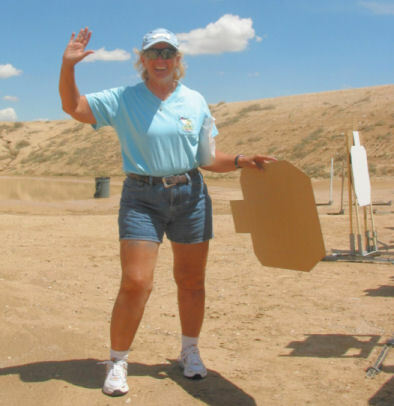 Words can not replace how good Vicki was to all of us at the range !!!!!!!!!!!!!!!!!!!!!!!!!!! Always great and uplifting to be around. I will miss her deeply !!!!!!!!!!!!!!!!!!!!!!!!!!!!!!!!!!!!!!!!!!!!!!!!!! Location:From the East Coast to the Desert Southwest...glad I came to my senses! There are never words to express a loss in your family, friends, or anyone close. Vikki was always smiling and friendly...her spirits were always high even during the past year while she was suffering from several physical issues. Wow, sorry to hear that. Know she was a good worker/friend of the NM Sectional matches. I have printed all the expressions of sympathy and support that are on here and I will take them up to Richard tomorrow at the services...I know his heart will be gladdened to know that Vicki had so many friends! Viki was an absolute sweetheart. Always a cheerful thing to say while wearing her ever present warm smile. God I will miss her. It will be a long time before I go shoot a local or area match and not wish she was there. My thoughts and prayers for Viki, Richard and the family. Rest in peace sweet lady. A lifetime of training for just 10 seconds. Hey Jake...you and I have been here before with Stewie....How are you? I have missed you, you know! I'm doing great, how have you been? Rod doing well I hope? my sincerest condolences goes out to family and friends.. Shocked and deeply saddened at the news. Always enjoyed being in her presence. Gracious, gentle, and positive. Richard -- there is probably nothing I can say or do to ease your loss. Please accept my condolences. I hope she did not suffer. And I hope you think it OK that I donate to a hospice in her memory -- to help those who will suffer. Cheryl -- thank you for what you are doing. I doubt I'll be able to get to Gallup tomorrow. Sorry to hear about the loss of your friend. My prayers are with you and the family!